Gov. Linda Lingle's re-election campaign has raised a total of $5.9 million since her 2002 election victory, an amount called "obscene" by one Democratic hopeful who has raised a fraction of that total. The two top Democratic challengers for the office, Randy Iwase and William Aila Jr., have so far collected $134,000 and $17,000, respectively, according to reports filed yesterday with the state Campaign Spending Commission. In a written statement, Lingle called her campaign fundraising "a tremendous outpouring of grassroots support." "I am both humbled and encouraged by the cross-section of the people statewide who support my initiatives," Lingle said. Iwase had a much different view. "It is obscene to raise $6 million for a race in a state with a population of 1.2 million," he said. Iwase said, however, the huge discrepancy in the fundraising does not deter him in his campaign which is focused on the primary and his main opponent, Aila. "In the primary we have a viable campaign. I can feel the momentum building and we are going to keep rolling," Iwase said. Iwase also criticized Lingle for raising money on the mainland. Lingle said she collected 14 percent of her money on the mainland during the first six months of this year. It is "outrageous that she is collecting money in places like New York, Philadelphia and Texas. I wouldn't go there to get money and they have no business in our state." A new state law limits candidates to raising no more than 20 percent of their donations from the mainland during any campaign reporting period. It is "outrageous that she is collecting money in places like New York, Philadelphia and Texas," Iwase said. "I wouldn't go there to get money and they have no business in our state." Asked if he would try to raise or accept money from mainland donors, Iwase said he would. "If offered, I would accept, but I wouldn't hold fundraisers on the mainland and if I had one on the mainland it would be for Hawaii ex-patriates," Iwase said. Funds raised and spent by major candidates for governor. 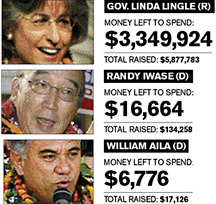 Lingle's reports show that since becoming governor she has held 62 fundraisers here and on the mainland. Yesterday's report shows that during the first six months of 2006, Lingle collected $762,000 and spent $590,000. In total, Lingle has spent $2.6 million for her re-election. The campaign reports show that she has had a paid political staff, including Miriam Hellreich, the GOP national committeewoman for Hawaii, and also maintained a campaign office before opening her public headquarters on Kapiolani Boulevard. Lingle has raised so much money that she earned $48,300 in savings interest on her campaign funds in the last six months and a total of $120,805 in interest since 2002. Also in this election cycle, Lingle has paid $100,000 to the Tarrance Group, a Republican, Va.-based research and public opinion group. In the last six months Lingle said she paid Tarrance $34,000 for public opinion surveys. Lt. Gov. James "Duke" Aiona has raised $177,000 in the last six months for a total of $368,000 since winning election. Aiona has spent a total of $248,000. Malama Solomon, Iwase's campaign co-chairwoman who is running for lieutenant governor, just announced for office last week and didn't file an expense report.